In this conversation, taped at George’s home in England on September 4, 1982, George reveals some memorable experiences he has had chanting Hare Krishna and describes in detail his deep personal realizations about the chanting. He reveals what factors led him to produce “The Hare Krishna Mantra” record, “My Sweet Lord,” and the LPs All Things Must Pass and Living in the Material World, which were all influenced to a great extent by the Hare Krishna chanting and philosophy. He speaks lovingly and openly about his association with His Divine Grace A. C. Bhaktivedanta Swami Prabhupada, Founder-Acarya (spiritual master) of the Hare Krishna movement. In the following interview George speaks frankly about his personal philosophy regarding the Hare Krishna movement, music, yoga, reincarnation, karma, the soul, God, and Christianity. The conversation concludes with his fond remembrances of a visit to the birthplace of Lord Krishna in Vrndavana, India, home of the Hare Krishna mantra, and with George discussing some of his celebrity friends’ involvement with the mantra now heard and chanted around the world. I realized later on that he was much more incredible than what you could see on the surface. you know. None of us are God–just His servants. 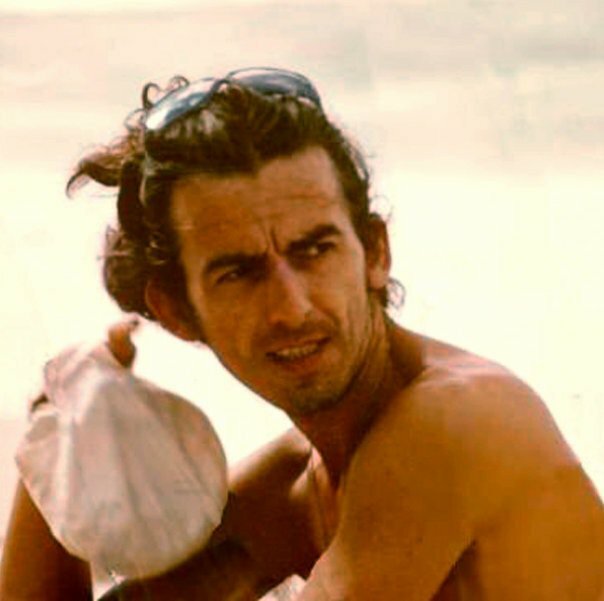 George: The thing that always stays is his saying, “I am the servant of the servant of the servant.” I like that. A lot of people say, “I’m it. I’m the divine incarnation. I’m here and let me hip you.” You know what I mean? But Prabhupada was never like that. I liked Prabhupada’s humbleness. I always liked his humility and his simplicity The servant of the servant of the servant is really what it is, you know. None of us are God–just His servants. He just made me feel so comfortable. I always felt very relaxed with him, and I felt more like a friend. I felt that he was a good friend. Even though he was at the time seventy-nine years old, working practically all through the night, day after day, with very little sleep, he still didn’t come through to me as though he was a very highly educated intellectual being, because he had a sort of childlike simplicity. Which is great, fantastic. Even though he was the greatest Sanskrit scholar and a saint, I appreciated the fact that he never made me feel uncomfortable. In fact, he always went out of his way to make me feel comfortable. I always thought of him as sort of a lovely friend, really, and now he’s still a lovely friend. George: Very wonderful, really. I mean it really gave me hope, because as they say, even one moment in the company of a divine person, Krishna’s pure devotee, can help a tremendous amount. 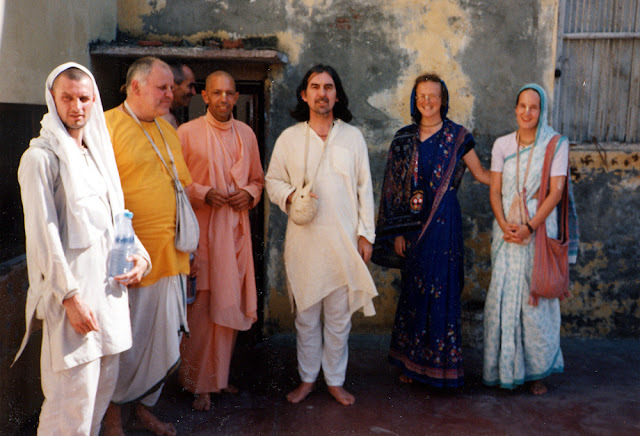 And I think Prabhupada was really pleased at the idea that somebody from outside of the temple was helping to get the album made. Just the fact that he was pleased was encouraging to me. I knew he liked “The Hare Krishna Mantra” record, and he asked the devotees to play that song “Govinda.” They still play it, don’t they? That was the thing about Prabhupada, you see. out of this place, but he was the perfect example…. He was a perfect example of everything he preached. Mukunda: Every temple has a recording of it, and we play it each morning when the devotees assemble before the altar, before kirtana. It’s an ISKCON institution, you might say. George: And if I didn’t get feedback from Prabhupada on my songs about Krishna or the philosophy, I’d get it from the devotees. That’s all the encouragement I needed really. It just seemed that anything spiritual I did, either through songs, or helping with publishing the books, or whatever, really pleased him. The song I wrote, “Living in the Material World,” as I wrote in I, Me, Mine, was influenced by Srila Prabhupada. He’s the one who explained to me how we’re not these physical bodies. We just happen to be in them. Like I said in the song, this place’s not really what’s happening. We don’t belong here, but in the spiritual sky: As l’m fated for the material world, Get frustrated in the material world, Senses never gratified, Only swelling like a tide, That could drown me in the material world. The whole point to being here, really, is to figure a way to get out. That was the thing about Prabhupada, you see. He didn’t just talk about loving Krishna and getting out of this place, but he was the perfect example. He talked about always chanting, and he was always chanting. I think that that in itself was perhaps the most encouraging thing for me. It was enough to make me try harder, to be just a little bit better. He was a perfect example of everything he preached. the amount of literature Prabhupada produced is truly amazing. days with only a few hours sleep. on the world. There’s no way of measuring it. George: Srila Prabhupada has already had an amazing effect on the world. There’s no way of measuring it. One day I just realized, “God, this man is amazing!” He would sit up all night translating Sanskrit into English, putting in glossaries to make sure everyone understands it, and yet he never came off as someone above you. He always had that childlike simplicity, and what’s most amazing is the fact that he did all this translating in such a relatively short time–just a few years. And without having anything more than his own Krishna consciousness, he rounded up all these thousands of devotees, set the whole movement in motion, which became something so strong that it went on even after he left. And it’s still escalating even now at an incredible rate. It will go on and on from the knowledge he gave. [Edititors note: Srila Prabhupada: “Even if they stop (the movement) externally, internally it will go on.”] It can only grow and grow. The more people wake up spiritually, the more they’ll begin to realize the depth of what Prabhupada was saying–how much he gave. the Supreme Person, Krishna, more into focus. George: They should be! One of the greatest things I noticed about Prabhupada was the way he would be talking to you in English, and then all of a sudden he would say it to you in Sanskrit and then translate it back into English. It was clear that he really knew it well. His contribution has obviously been enormous from the literary point of view, because he’s brought the Supreme Person, Krishna, more into focus. A lot of scholars and writers know the Gita, but only on an intellectual level. Even when they write “Krishna said…,” they don’t do it with the bhakti or love required. That’s the secret, you know–Krishna is actually a person who is the Lord and who will also appear there in that book when there is that love, that bhakti. You can’t understand the first thing about God unless you love Him. These big so-called Vedic scholars–they don’t necessarily love Krishna, so they can’t understand Him and give Him to us. But Prabhupada was different. Well, Prabhupada’s definitely affected the world in an absolute way. knowledge. I mean there just isn’t anything higher. Why did you feel you wanted to put Hare Krishna on the album at all? Wouldn’t “Hallelujah” alone have been good enough?